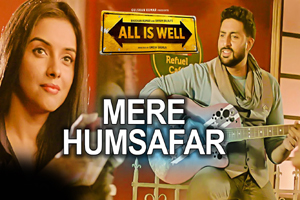 Lyrics Of Mere Humsafar From Latest Movie - All Is Well (2015): Nice romantic song in the voice of Tulsi Kumar, Mithoon featuring Abhishek Bachchan, Asin. Star Cast: Abhishek Bachchan, Asin, Rishi Kapoor, Supriya Pathak, Mohammed Zeeshan Ayyub. The video of this song is available on YouTube at the official channel T-Series. This video is of 2 minutes 12 seconds duration. Lyrics in Hindi (Unicode) of "मेरे हमसफर"